It happened again! We’ve been so busy with visitors that we’ve been neglecting the blog posts. During the summer while we were living in Ft Myers Beach, we knew we’d attract a lot of visitors. After all, it was summer, we lived on the beach, had a pool, etc. As we said in our Visitor Extravaganza post, two-thirds of our time in Florida was spent with family or friends. We also thought once we got to Breckenridge, we wouldn’t get as many visitors – especially when there wasn’t any snow on the ground. Well, we were wrong. Dead wrong. Kelly’s cousin Kim and her husband Mike live in Denver. Kim’s parents Uncle Ken and Aunt Mary Beth came to visit them during Labor Day weekend. They made a trip up to Breck too and spent an afternoon with Kelly and Alex doing some hiking on our favorite trail, Fairy House Trail. 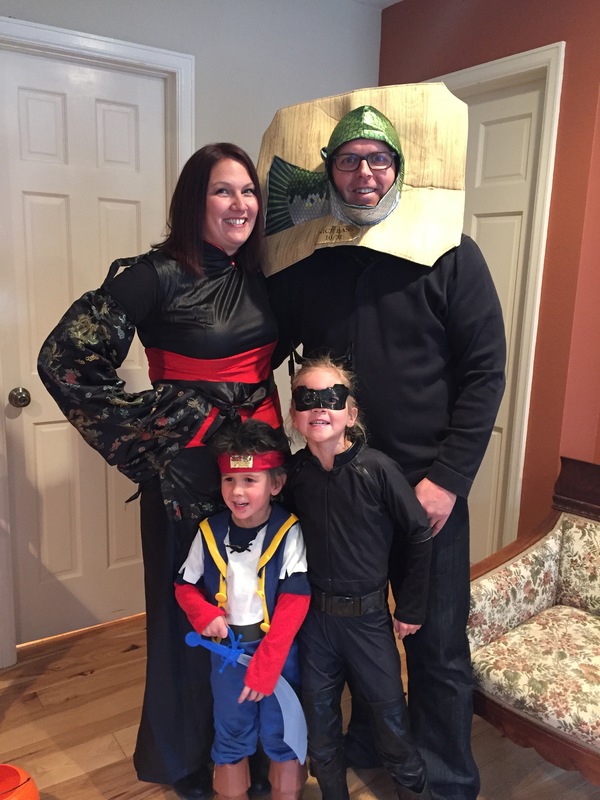 That night we all headed to a rental house that Kim and Mike had lined up. We watched football, grilled brats and enjoyed the gorgeous views. The clear, starry night was amazing. Guess that ‘s what happens at 11,000 feet with no big cities for miles. As soon as we got settled into the house after our first few weeks in Breck, we had houseguests. 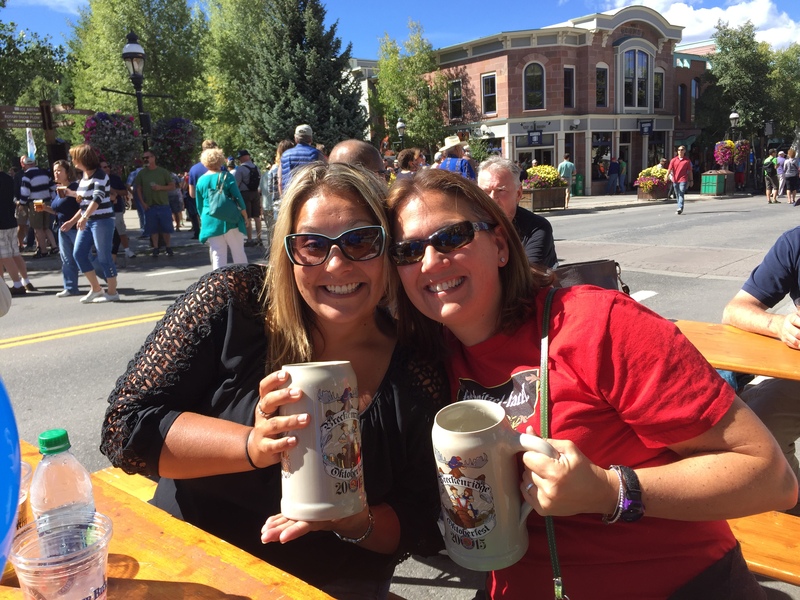 The occasion was Oktoberfest the weekend of September 11th and Breck knows how to throw one heck of a party. We hosted our friends Helen and Mark, Steph and her boyfriend Ryan. The plan was for our friends to arrive Friday afternoon and lay low until Saturday when we had planned for a babysitter. Guess that’s famous last words as we ended up getting a “bonus” day of Oktoberfest with lots of drinks and fun. Alex was with us during the day and Zoe joined after school in her dirndl. On Saturday morning, Steph and Ryan headed back to Denver, but Helen, Mark and the rest of us took the gondola up to the base of Peak 8 and hiked the Fairy House trail down to Sawmill. It was a nice relaxing time and the kids loved throwing rocks into the river. Saturday afternoon we donned the traditional Oktoberfest lederhosen and dirndls and off we went to the party. The weather couldn’t have been more perfect. We spent the day on Main Street people watching, drinking and catching up. We will hold memories from this weekend dear to our hearts. My mom (aka Grammy) arrived to my brother Dustin’s place in Denver on Friday, September 18th and they drove up to Breck that night. It was another great visit and the kids always love doing projects with her. The week was spent showing Grammy around Breck (her first visit). She got to take Zoe and Alex to their schools, play at the parks and, of course, do some shopping on Main Street. 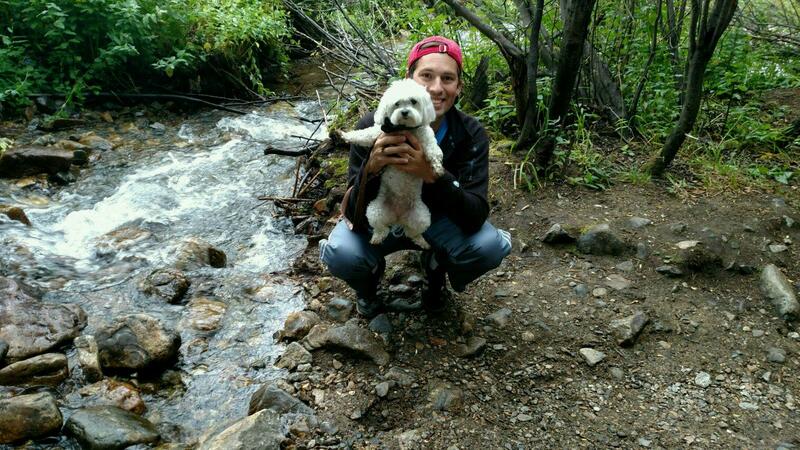 We also did a couple of hikes with the kids. We did the Fairy House trail, as it’s our favorite. Also, we hiked the Iowa Hill trail where they still have a lot of artifacts on display from the mining days. On Tuesday, we got out to the ice rink so Grammy could see Zoe and Alex in their ice skating lessons. They both did a great job showing off their new skills for Grammy. On Thursday we all went back down to Denver for my brother’s 30th birthday. My dad flew in for the occasion too. We tried to surprise Dustin, but with a couple of slip-ups by my mom and myself, it wasn’t much of a surprise in the end. We went out to dinner and when Dustin showed up Grammy had pictures of him put onto Popsicle sticks to harass the newly 30 year old. The kids loved it! My Uncle Veryl and Aunt Debbie also joined the party. It was the first time they had met Zoe and Alex so lots of hugs for them both and, of course, harassment from Uncle Veryl was in order. It was great having the whole family together in Colorado. Kelly’s parents (aka Mema and Bumpa) arrived as my parents were leaving on Saturday, September 26th. We drove them up after an afternoon of drinking water and getting ready to acclimate to the altitude. Sunday morning we went for Daylight Donuts, our new favorite breakfast spot in town. We then burned off some of those calories by hiking the Fairy House and Sawmill Creek trails with the kids. It was the first hike of what would later be the called “Boot Camp” week. We grabbed lunch at The Crown on the back patio and looked at the HUGE trout by the Dredge. They were jumping out of the water and caused a frenzy when we fed them. We ended an action packed Sunday with a night hike at Old Dillon Dam trail to view the lunar eclipse (“blood moon”). At first it was cloudy but then it cleared just in time for us to see the orange colored moon. The kids thought it was pretty cool walking down the trail with flashlights. The adults cracked some beers on the trail to celebrate. On Monday we relaxed and decided to drive the Boreas Pass. The views up there are amazing and it was the tail end of the peak season for leaves changing. Tuesday both kids were in school so it called for some more “boot camp” hiking. We headed up to Hoosier Pass and hiked 3 miles with expansive views down 10-mile range and Baldy Mountain. We grabbed lunch at Canteen out on the patio and enjoyed the ski area views. That night we all took the kids to their ice skating class. They did really well and loved having us all there. Afterward we went to Zoe’s school so Kelly and I could get fingerprinted for volunteering. 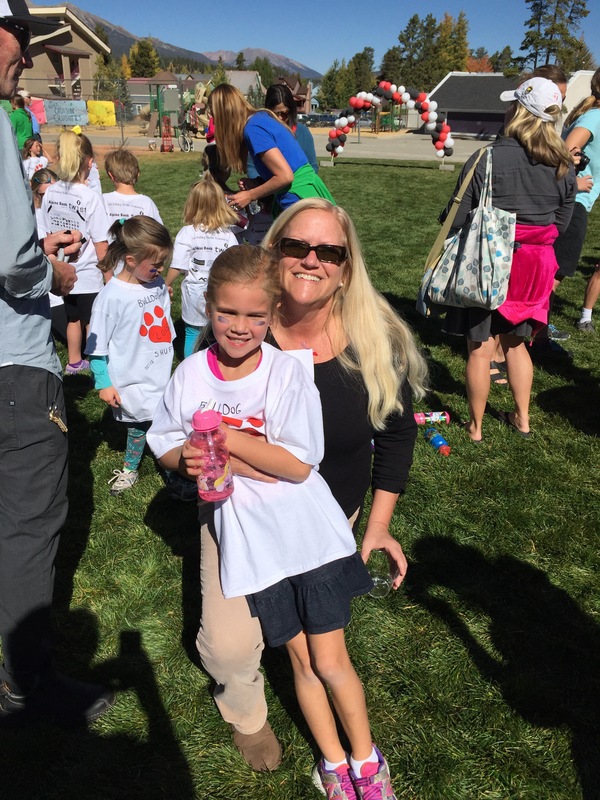 It was a great chance for Zoe to show Mema and Bumpa her school and classroom. Zoe was very proud. Both kids have full days of school on Wednesday so we hit up a tough 5-mile hike in Frisco at North Ten Mile trail. It was a nice mix of wooded trails, beaver dams and some views of area ranges. 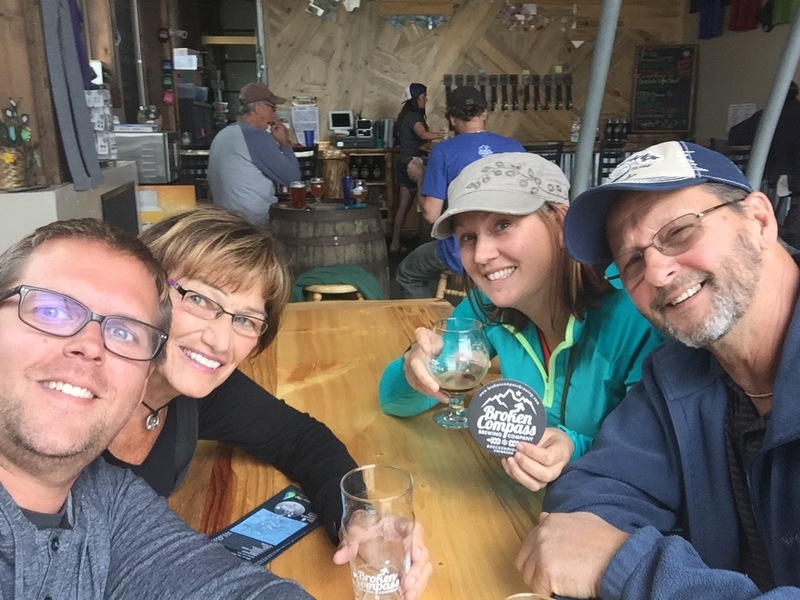 We treated ourselves to chicken wings and potato skins at Backcountry Brewery, followed by Hefeweisen beer at Broken Compass Brewery in Breck and finished up with a tour and tastings at Breckenridge Distillery. Boot Camp continued on Thursday with two different hikes. First was the Old Dillon Dam trail by Lake Dillon – the same one we’d done a bit of during the lunar eclipse, but now in the daytime. We then did the Iowa Hill trail in Breck. We continued our normal reward system by grabbing beers at the oldest bar this side of the Mississippi -The Gold Pan Saloon. We even met the owners as they were setting up a party for a departing employee. We ended the amazing week with a great dinner at Blue River Bistro. We all got the steak and enjoyed a day WITHOUT hiking! Saturday morning we got up early and drove Mema and Bumpa back down to the Denver airport. It was a great visit and we can’t wait for the next one! One of my best friends, Tim, was in Colorado for a work conference and was able to break away on Saturday for a visit. 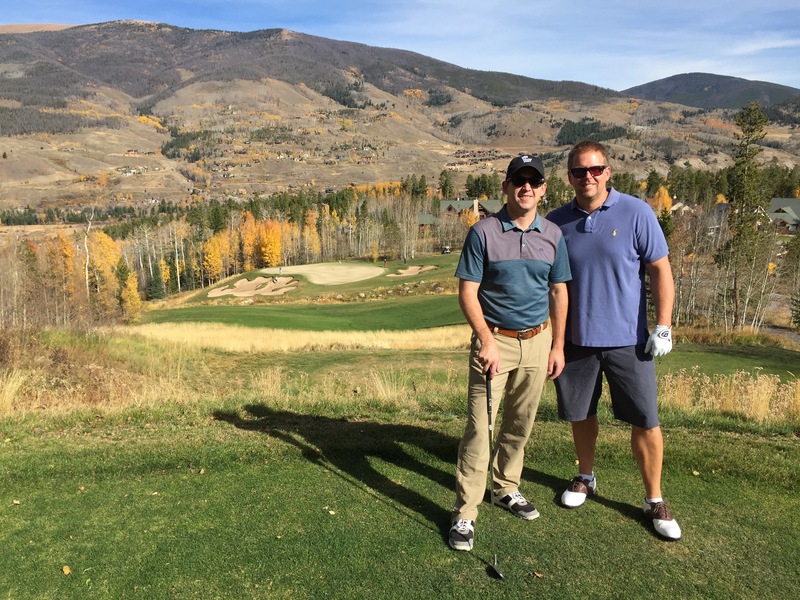 We met at the Raven Golf Club in Silverthorne on a beautiful afternoon. We got paired up with a couple of locals that provided some good entertainment too. After Tim had a great round of golf (typical) and I stunk it up (also typical), we headed back to Breck. Kelly got a babysitter so the three of us had a chance to go to a nice dinner and catch-up. Afterward we met my brother and his girlfriend Lara at Ollie’s to watch some college football. We ended the night by watching “Ski School” and having drinks at our place. He took off in the morning to get back to work (bummer). It was great having Tim visit. Maybe next time with his family or the other Delt boys. After almost a 2-week break of visitors – a rare thing since we started Project Pink Day – our good friends Ryan and Sara McMorrow made the trip without their kids. It happened to be the same day that we got our first big snowfall, so we had some concern about getting them from the airport, but roads cleared by the afternoon. After getting them at the airport early evening, we took them to Vine Street Brew Pub by my brother’s place. The plan was to stay the night there as Dustin and Lara were at a friends wedding out of town. That night we got the kids to bed and stayed up way too late drinking, laughing and catching up. It was a really fun night of playing music from the 90’s and NOT playing any of Sara’s suggestions. Sorry Sara! The next morning we all (mostly Ryan) definitely paid for our good times! On Friday morning we grabbed breakfast at Denver Biscuit Company. After some good food and lots of coffee we were ready for the drive up the mountain. We had to stop at a brewery called Pug Ryan’s – since Ryan owns a Pug. After a couple of beers and a light lunch, we finally got to our place in Breck. That night we ‘d arranged a babysitter and we headed out for some bar hopping. There was a Poker Run setup that night for one of the festivals. 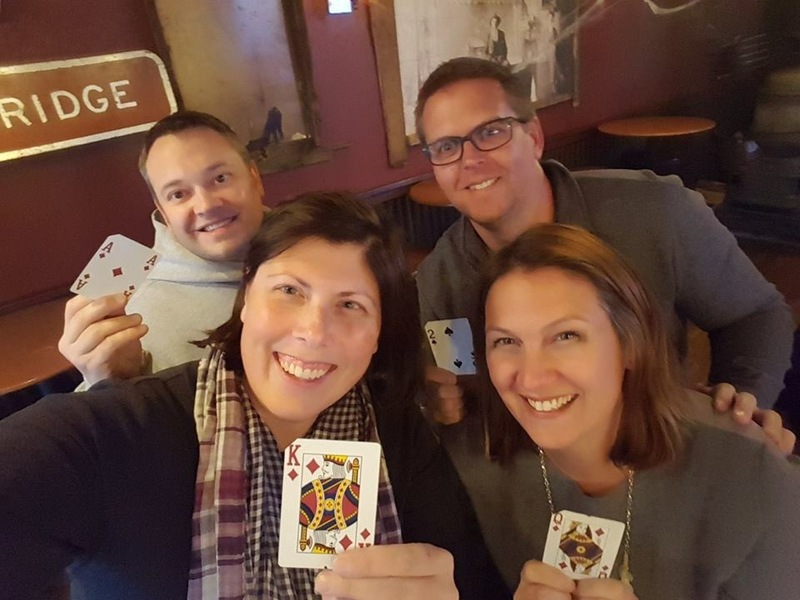 The idea was to try out different bars with different mixed drinks and they’d give you a playing card to try to win with the best hand. We never did win, but had lots of fun. On Saturday we all walked and shopped around on Main Street. Ryan even got the kids looking for “treasure” by introducing them to geocaching. They loved it and I’m sure we’ll be doing it a lot more in the future! 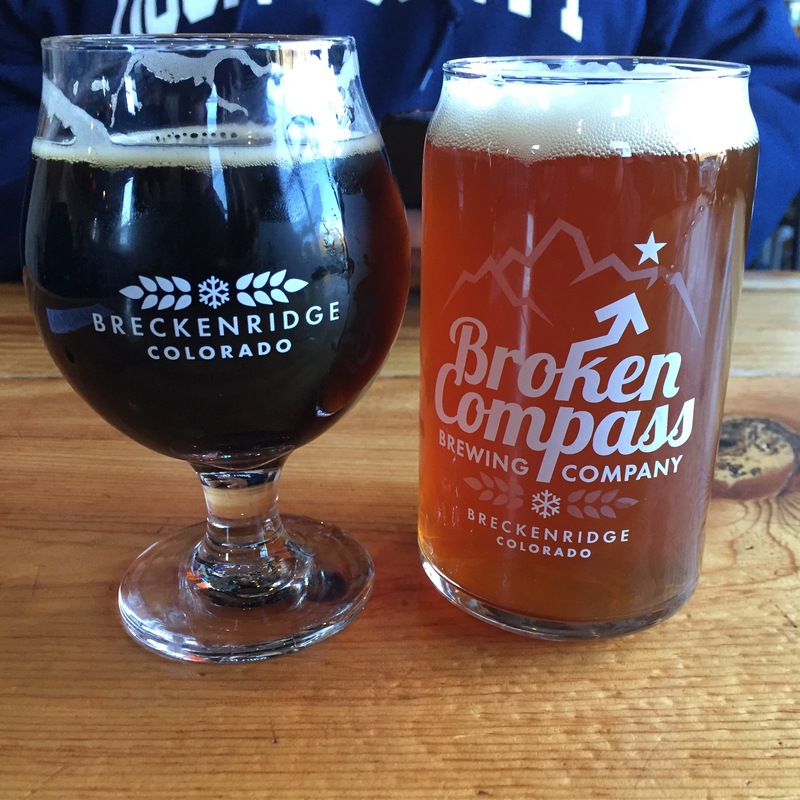 We hit up Breckenridge Brewery for lunch and afterward Ryan and I tried out Broken Compass. That night we were all tired and decided to stay in, make some lasagna with the kids and once they were in bed played some Cards Against Humanity – Clams! Sunday morning I drove them down to the airport. It is always great seeing the McMorrows and is a good reminder that no matter where we live, we have some pretty great friends that we will always share good times with. from our Delt house days at Iowa State. That night was low key as we caught up, had a few drinks (including some great Ankeny brews) and watched some classics, like Better Off Dead. Saturday was Halloween so the kids dressed up in their costumes and we all headed down to Main Street for some trick or treating at the shops. We went to our new favorite, Mi Casa, for lunch. That night Andy and Melissa headed to Ollie’s to watch the ISU vs. Texas game, while we got ready for Halloween with the kiddos. We invited Kerry, Colum, baby Seamus and Alex’s best friend Méabh over to join us. They blocked off the roads around us, so we trick or treated in our neighborhood. Zoe’s friend Courtney and her family met up with us too. It was great weather and was so nice to have many friends around for the kids and us. There was even a free Haunted House that everyone (except me of course) went into. Sunday morning we all headed down to Dustin’s for the REAL reason Andy and Melissa were here – the Broncos / Packers Sunday Night Football game – both teams were undefeated. We had lunch at Vine Street before dropping off the kids with Dustin and Lara. While tailgating in one of the overflow parking lots, we saw some guys drinking a strange concoction. Turns out it was cava from Fiji. We took a shot not knowing how we’d react, but it all ended up fine (except for a numb tongue). We took a quick rickshaw ride to the stadium before game time. It was a perfect evening for a night game – especially on November 1st! After soaking in the atmosphere and taking a few pictures outside, we headed into Mile High stadium. Since we didn’t have seats together we said our goodbyes then. It was a short but great visit with the Schnurrs. In the end Broncos win! 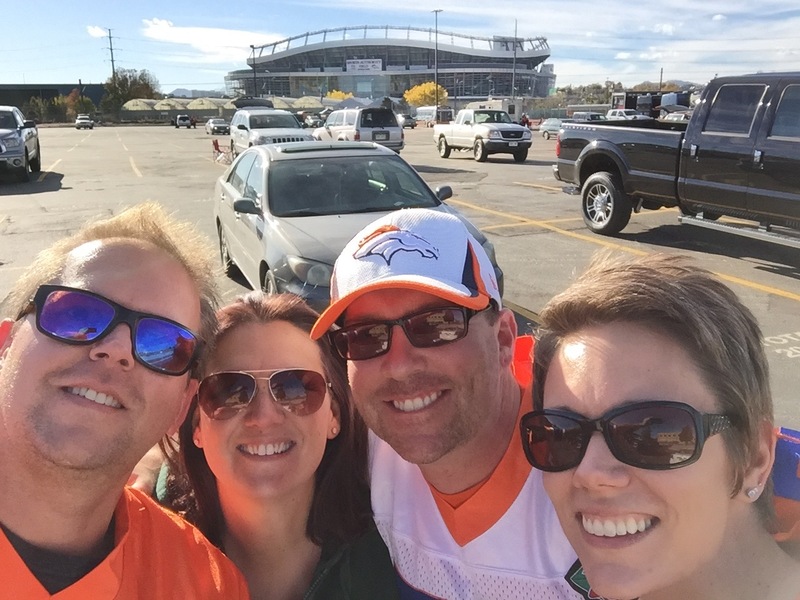 Kelly wasn’t happy but the whole stadium was rocking and Broncos remained undefeated. Can’t wait for more family and friends to come visit. Let the good times roll!